The Peak Deluxe One Piece is shoulder zip entry hard hitting whitewater dry suit designed to keep to dry and warm in the toughest river and weather conditions. The Peak Deluxe One Piece dry suit is an ergonomically cut, stylish and hard wearing dry suit. Designed to keep you warm and dry in the harshest winter river conditions. 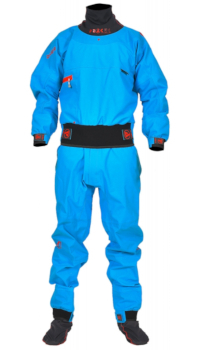 The Deluxe One Piece suit features a shoulder entry zip system as well as vertical front relief zip. Reinforced seat, knees and bum as well as latex wrist & necks seals with outer neoprene cover. Constructed from Peak X4 4 layer fabric with fully taped seams and built-in fabric socks. As with all Peak UK products, this suit has been fully tested by real paddlers and is built to last with all the function of a top paddling suit at a very reasonable cost. Inside Leg - Measure from you ankle bone to your groin. Chest - Measure horizontally under the armpits around the fullest part of your chest and shoulder blades. Waist - Measure the waist circumference at the smallest part of your waist, often at the belly button.